Milk and milk products are an important part of most healthy lifestyles. They are a valuable source of nutrition, providing vitamins, minerals, and protein. One of the nutrients in milk is lactose, which is a sugar. The body uses an enzyme called lactase to break down lactose so it can be absorbed into the bloodstream. Sometimes there is not enough lactase to digest the amount of lactose that has been consumed. And when this causes symptoms, it is know as lactose intolerance, which is rarely a serious condition. Among the common signs of lactose intolerance are nausea, abdominal cramps and bloating, gas and diarrhea, which may occur 30 minutes to two hours after eating foods containing lactose. If you have any of these symptoms, your doctor can perform several tests to determine if you are lactose intolerant or if you have a more serious digestive condition. You can test yourself at home, since lactose intolerance is a mild disorder. 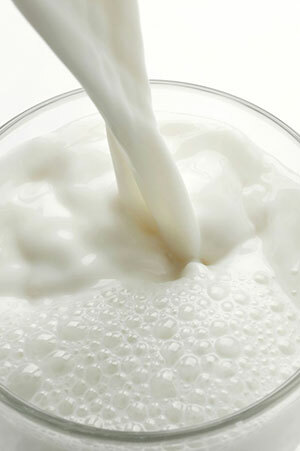 To begin the test, avoid all milk and lactose-containing foods for three or four days. Then, drink two large glasses of skim or low-fat milk (14-16 oz). If you have symptoms within four hours, you are probably lactose intolerant. However, you should still see your doctor for confirmation. While there is no medication to eliminate lactose intolerance, you can follow some simple guidelines to avoid symptoms. You can restrict the amount of lactose you ingest to about 1/2 cup of milk, since most people can tolerate small amounts of it. Try eating smaller portions several times a day. Milk and milk products are an important part of a nutritious, well-balanced diet. If you think you might need to restrict your lactose intake, this should only be done in consultation with your doctor or a dietician.